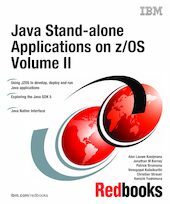 This IBM Redbooks publication is the second book in a series of two about Java stand-alone applications on z/OS. We recommend using this document as a complement to Java stand-alone Applications on z/OS Volume I, SG24-7177. This book explains some topics discussed in Volume 1 in more depth, and also provides information about additional topics. It pays special attention to JZOS, a newly integrated function in the z/OS SDKs that can be used to run Java batch jobs and perform I/O. This document also features other interesting topics, such as the use of Eclipse and WebSphere Developer for zSeries for integrated development of stand-alone Java applications, Java Native Interface (JNI), the new Java Virtual Machine Tool Interface (JVMTI) and problem determination with SDK 5 on z/OS.